Spotcap is the new innovative online credit platform providing fast and flexible financing to small businesses. The company’s mission is to enable business owners to invest and grow without having to worry about how to finance their projects. Applying for Spotcap’s credit lines takes as little as five minutes making it the fastest online credit. Madrid, September 4th 2014 – Spotcap is the new innovative online credit platform providing fast and flexible financing to small businesses. The company’s mission is to enable business owners to invest and grow without having to worry about how to finance their projects. Applying for Spotcap’s credit lines takes as little as five minutes - making it the fastest online credit. Spotcap uses an innovative credit scoring technology that directly evaluates real-life business data from the customer’s online accounts. All of that without the tedious paperwork, long waiting times and stringent credit criteria typically imposed by banks. Today the company launches its business in Spain with an initial focus on online merchants and plans to expand its service both geographically and across products. SMEs account for 65% of GDP and 80% of total employed people in Spain. As such, SMEs fuel the Spanish economy and are often the driving force behind important innovations. The convenient and fast credit lines from € 500 - € 50,000 that Spotcap provides to small online business owners therefore play a vital role in supporting macroeconomic growth and increasing employment. The business world is changing quickly and business owners require new and innovative ways of financing to grow their business. This is why the architects of Spotcap developed a unique algorithm which assesses the real-life financial performance of customers rather than solely looking at customers’ financial history. At Spotcap, online business owners simply connect their online merchant accounts and receive an instant credit decision. Once approved, businesses can flexibly draw on their credit line when they need it, in order to pursue opportunities as and when they arise. 1. Application: Online merchants apply for credit lines ranging from € 500 to € 50,000 on www.spotcap.es. 2. Assessment: Spotcap’s unique algorithm checks the business’ performance and creditworthiness, providing instant feedback. 3. Offer: Spotcap proposes a non-binding offer for a credit line, with the amount and cost based on the company’s scoring. 4. Payout: The business owners can request a payout whenever and wherever they need upon confirmation of the credit terms. Spotcap enables small business owners to grow their business by providing fast and flexible financing which leverages cutting-edge technology. 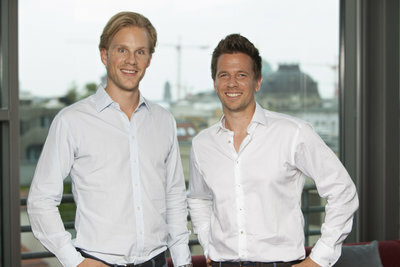 The company was launched in Madrid in September 2014 and is led by co-founders Toby Triebel and Jens Woloszczak in Berlin and managing director Pablo Pastega, who leads Spanish operations. The team - currently consisting of 30 credit and online experts - plans to expand its service both geographically and across products. Spotcap is backed by Rocket Internet – the world's leading global internet platform outside of the US and China.